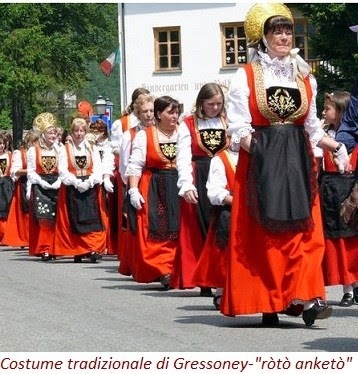 Today I will be speaking about the region of Greschôney, Gressonèy or Gressonei. 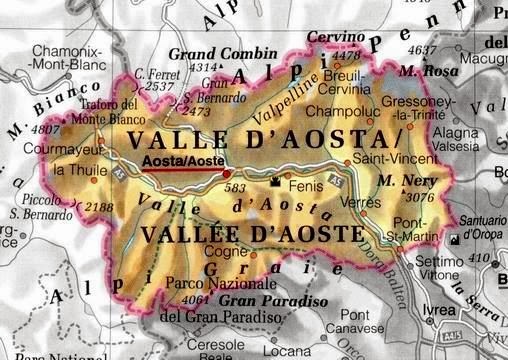 This consists of the middle and upper regions of the valley of the Lys river, in the northeast of the Valle d'Aosta, just west of Val Sesia, which I wrote about in my last article. 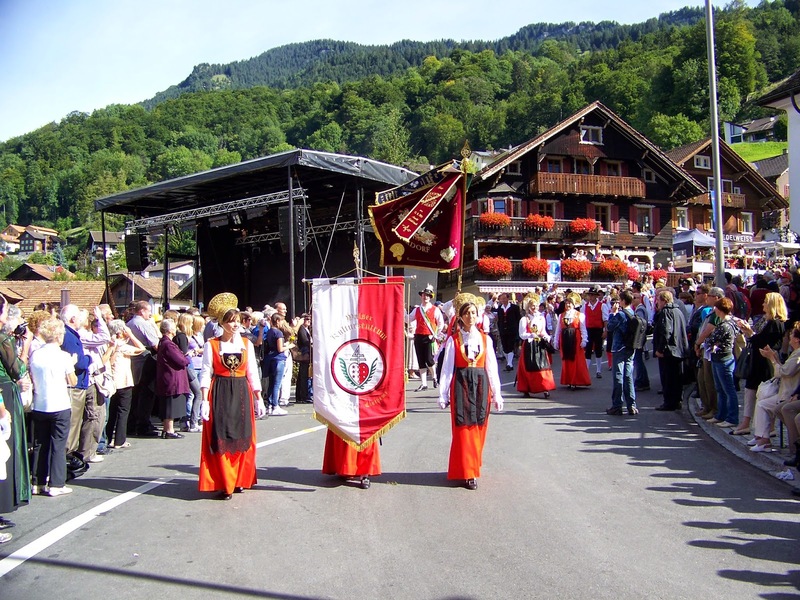 There are two municipalities in this region, Greschòney Drifaltigkeit or Gressoney-La-Trinité, and Greschòney Zer Chilchu or Gressoney-St.-Jean. As you can see from the first map, this valley is isolated on three sides. 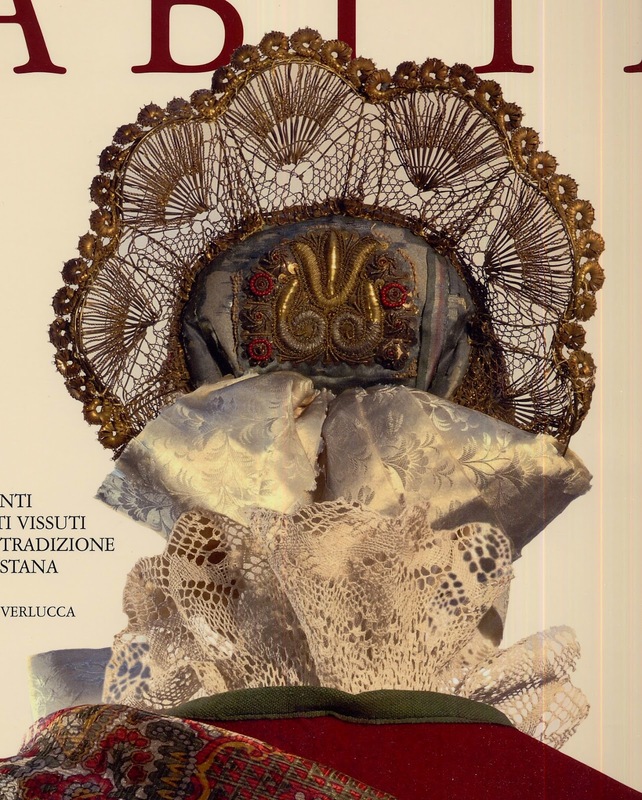 The linguistic and ethnic history of Aosta is rather complicated. 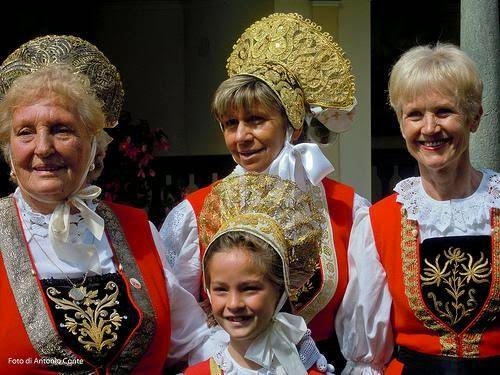 It was traditionally a part of the Kingdom of Savoy, and as a reflection of this, the traditional language of most of the people of the valley is Valdôtain, a dialect of Arpitan. 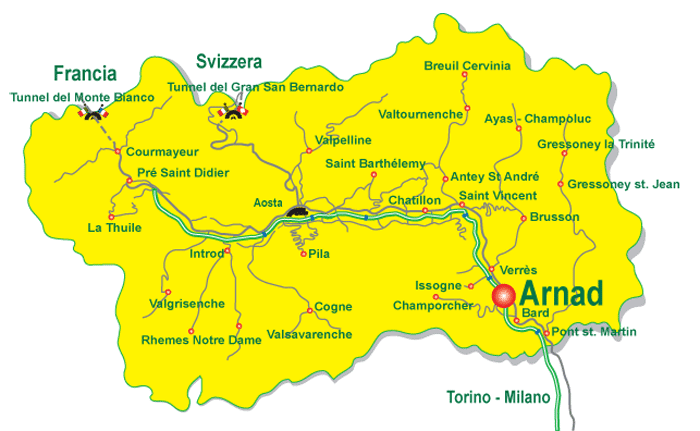 This valley has a long history of a great deal of autonomy, and in 1536 adopted modern French as its official language. 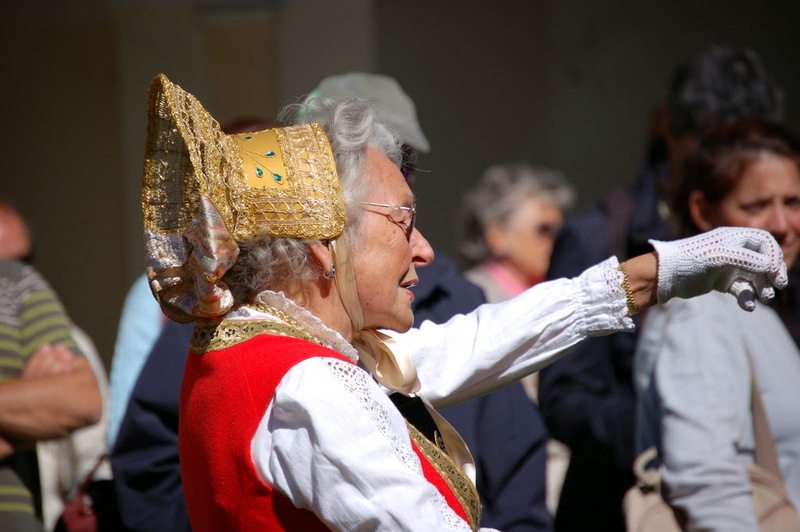 It has been officially part of Italy since 1870, and the Italian government has made attempts to impose the Italian language on the population, especially under Mussolini. 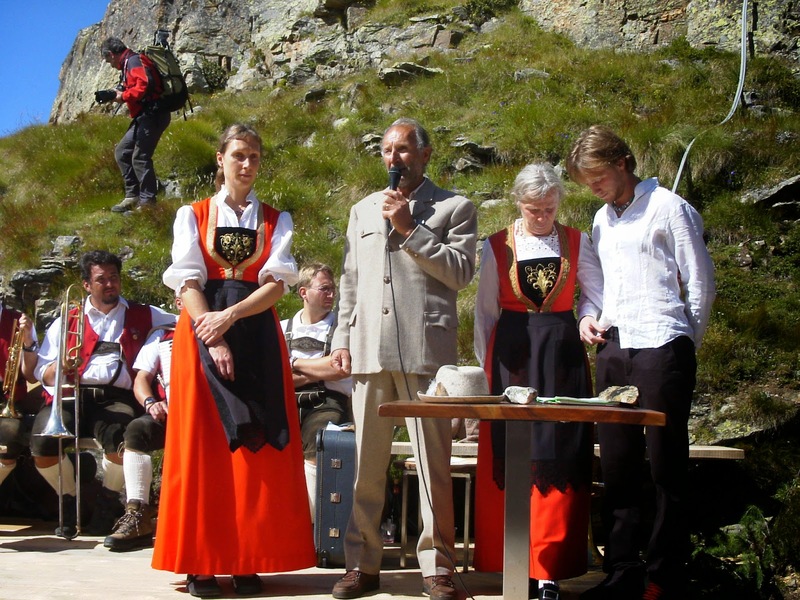 Today Italian and French are both official languages in Aosta, and both are used in Education. 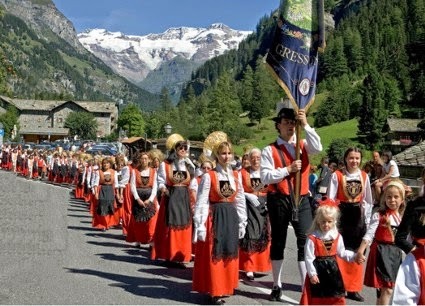 In Gressoney and the Lys valley, however, the people are Walser, having migrated from Switzerland in the 10th century, and their traditional language is Greschuneititsch, or just Titsch, a dialect of Allemanic German. 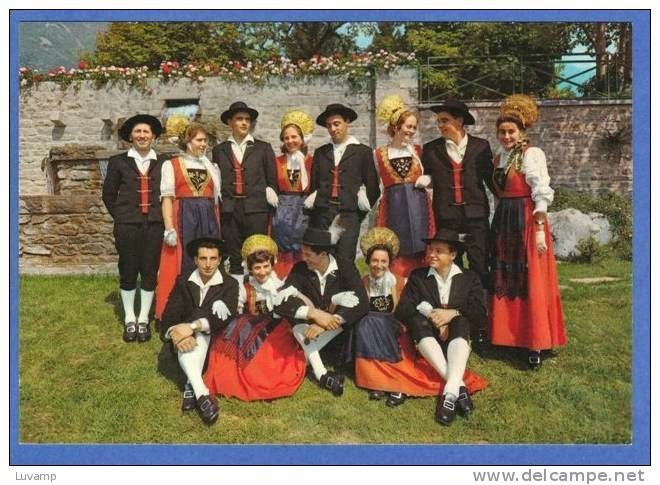 They border other Allemanic speaking areas to the north, in Wallis, Switzerland, and to the east, in Val Sesia, Piedmont, Italy. 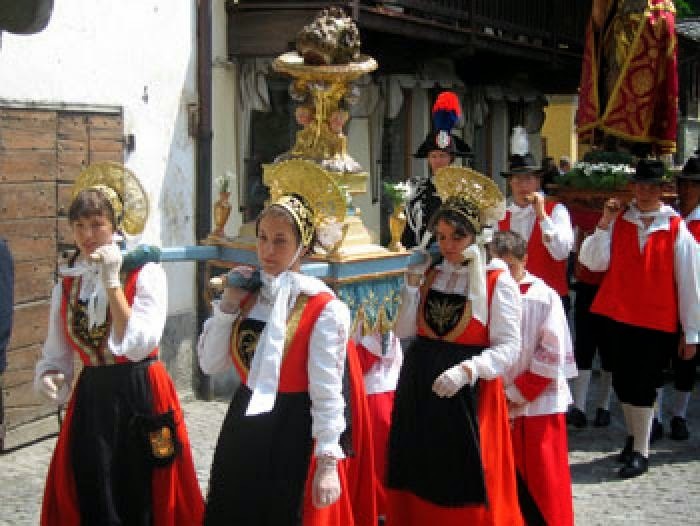 This is likely the best known of the traditional costumes of Aosta, it may certainly be the most colorful. 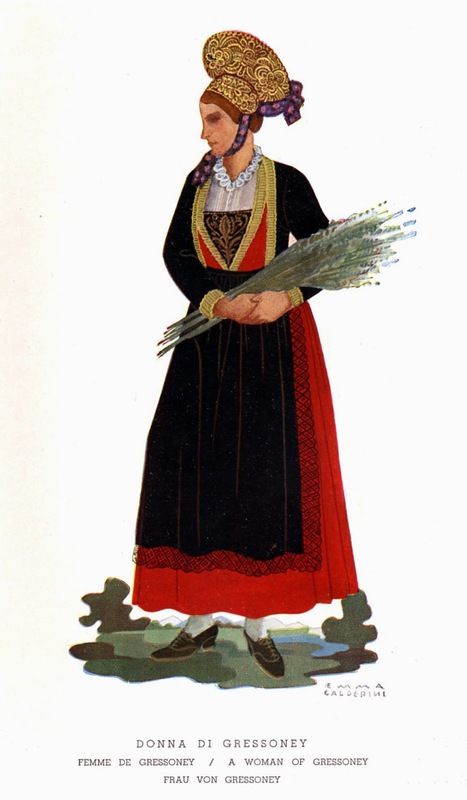 Here is Calderini's print of the costume. 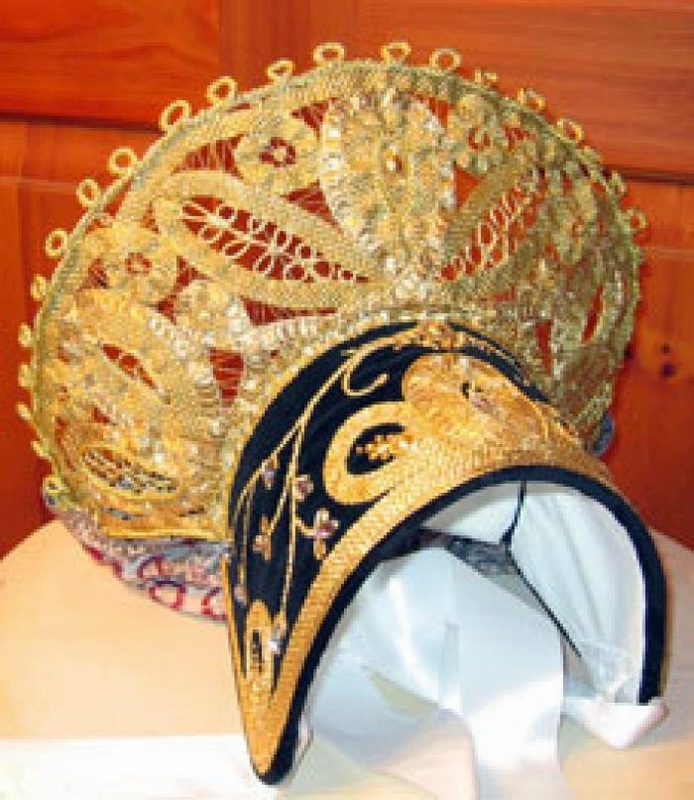 "Bonnet of gold lace supported by steel wire, and secured with a brocade ribbon. Skirt of fine red homewoven wool. 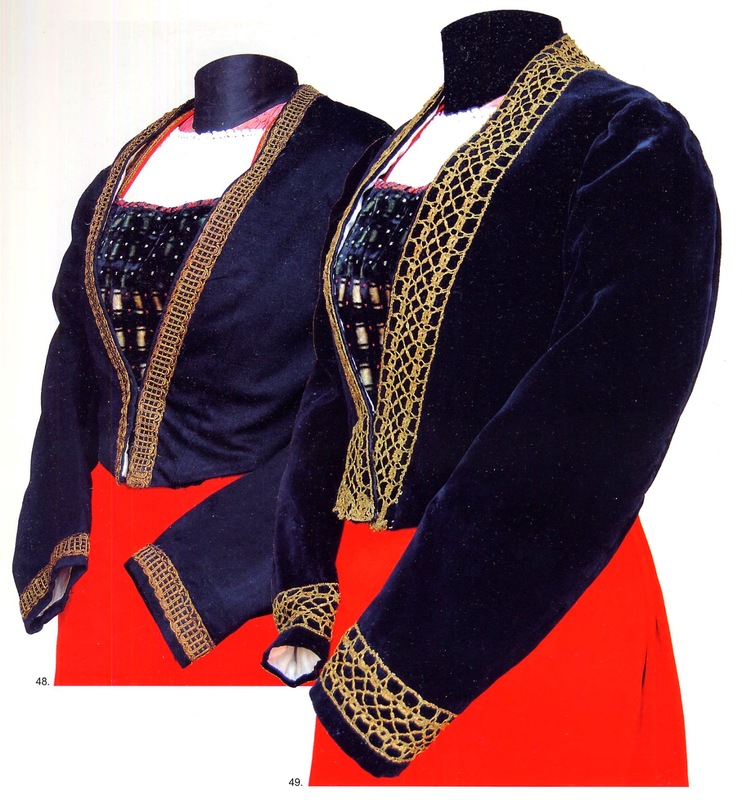 Bodice and corset of black wool with gold galloon. 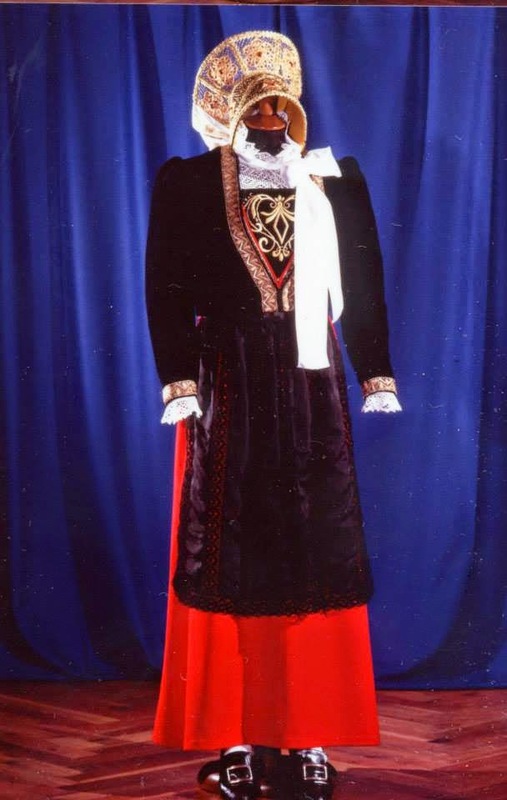 Apron of black silk. Knit stockings. Shoes of black leather with laces." 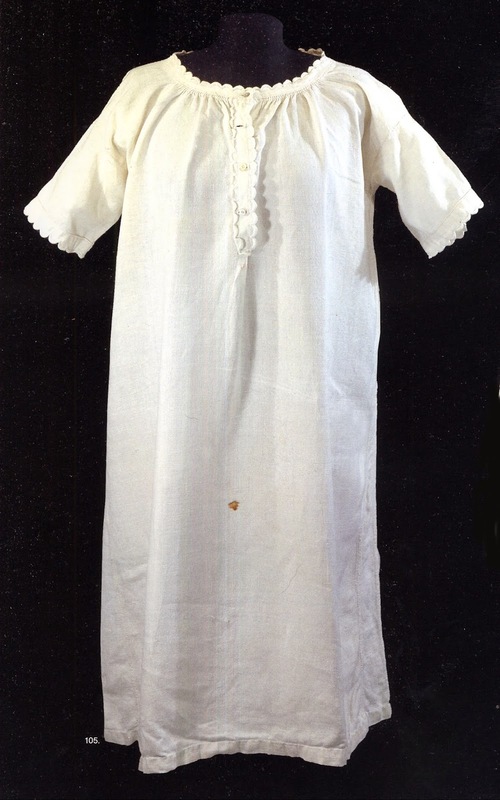 The foundation garment is a linen or cotton chemise, usually with lace around the neck opening. 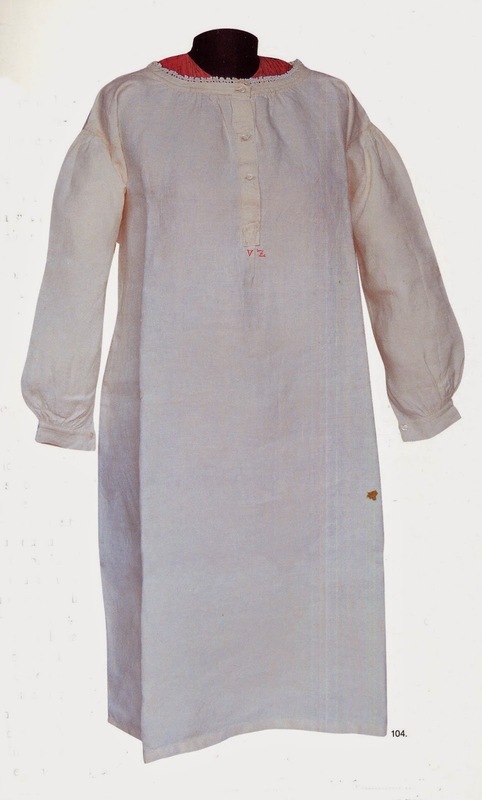 It generally opens down the front, and may have long or short sleeves. There is a great deal of variation in the details. For festive occasions, a dickey with more impressive lace may be worn over the chemise. 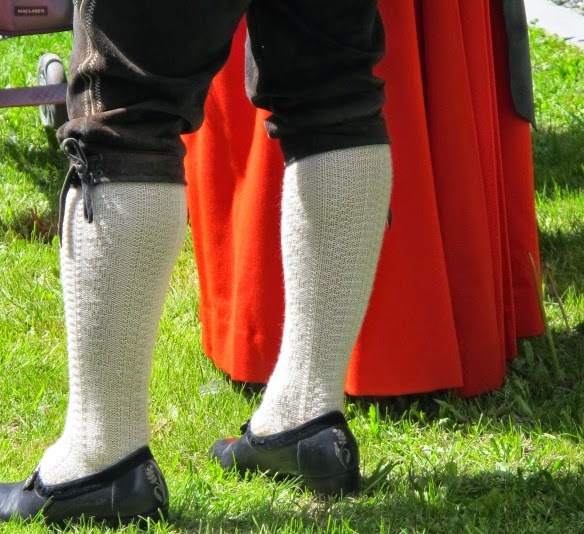 These have a cord which passes through a fold on the bottom hem front and back, under the arms and is knotted in front. 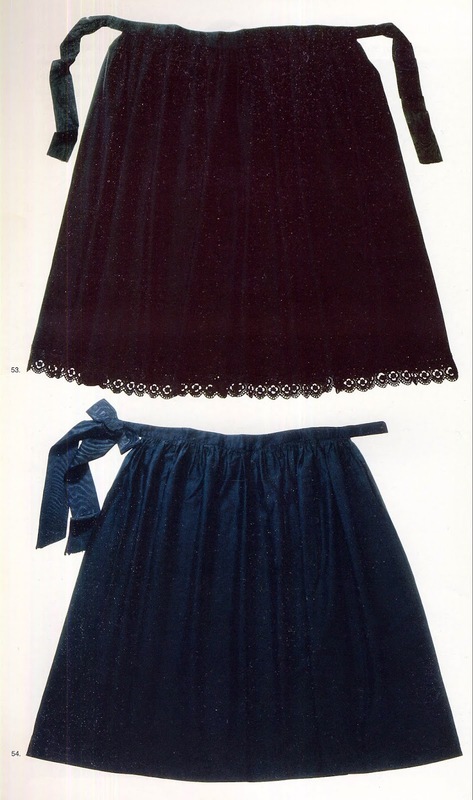 In collections there exists one example of a skirt without a bodice, which would have been worn for everyday, or as an underskirt for the festive costume. 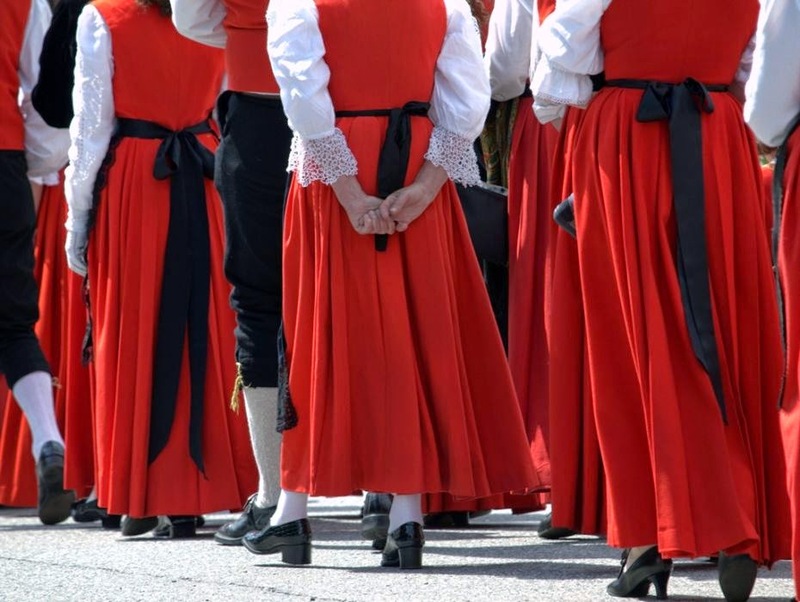 The dress skirt is full, gathered in back, ankle length, and today is usually red, although in the past darker colors were also worn for periods of mourning and by older women. 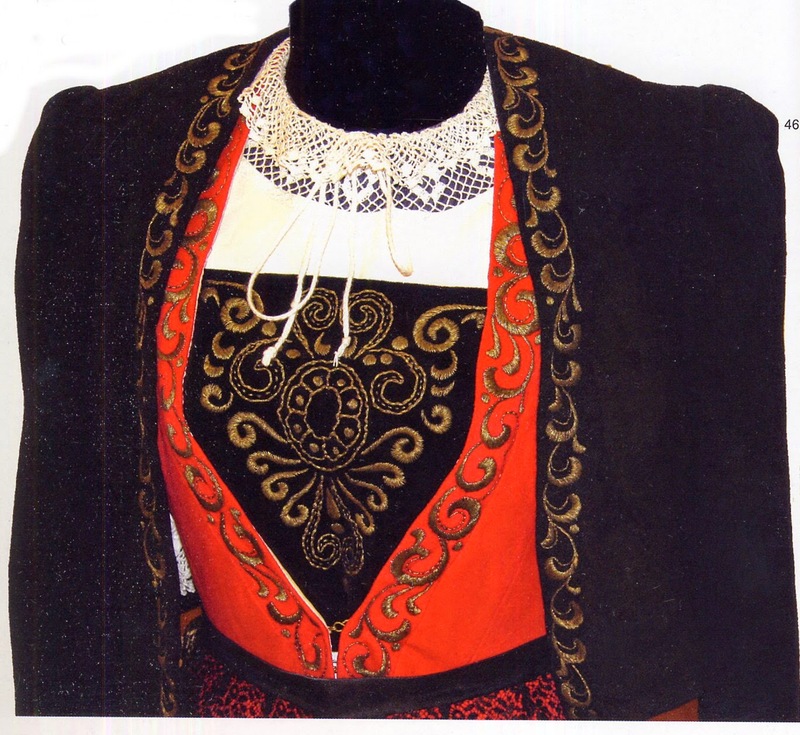 In spite of Calderini, the attached bodice is also red. Most commonly today with a V shaped opening that hooks closed in front. 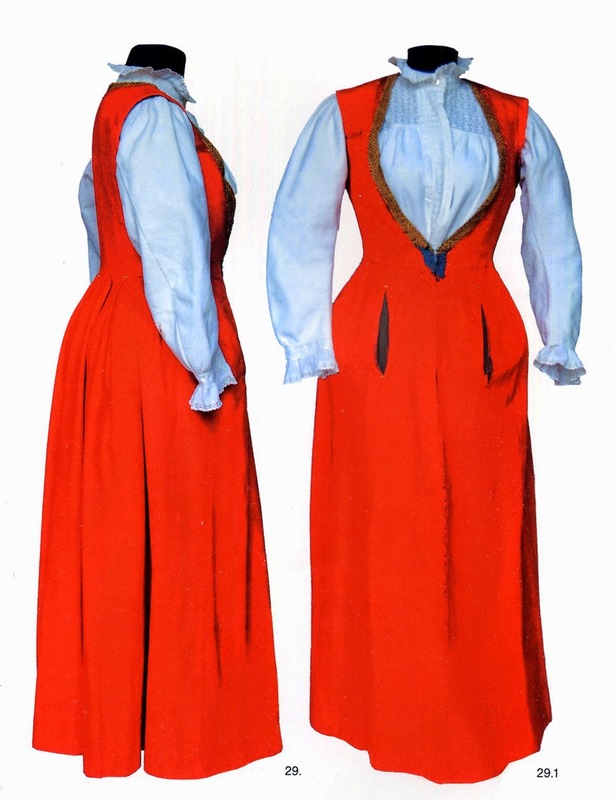 This example has two slashes in the front which would have provided access to loose pockets worn hanging from the waist under the skirt. 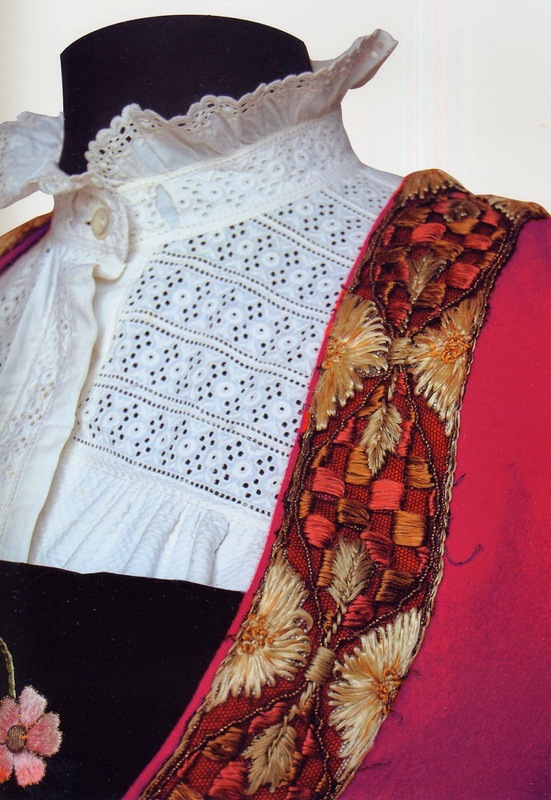 The neck and front opening is edged with gold galloon, woven or embroidered ribbon, or appliqued cloth in various colors and patterns. 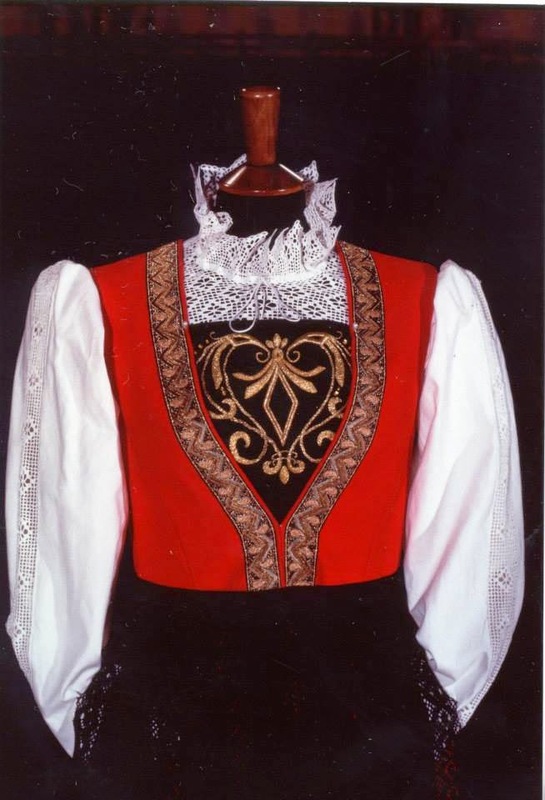 When this type of bodice is worn, a plastron is worn under it. 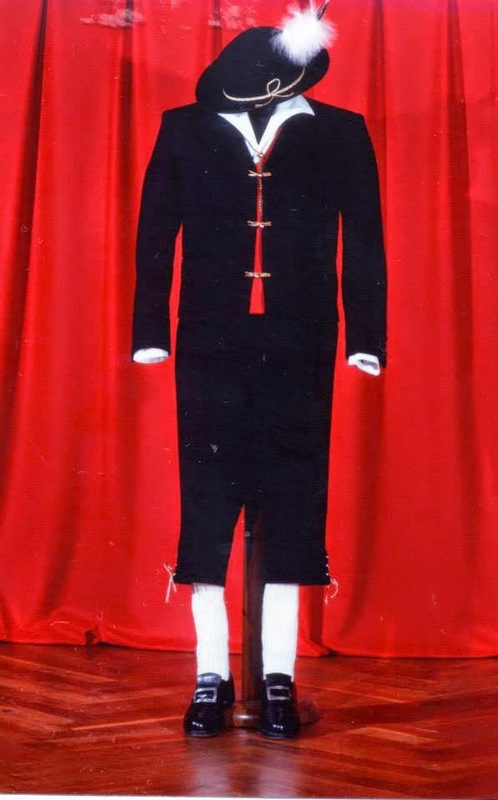 This is usually black wool with embroidery. 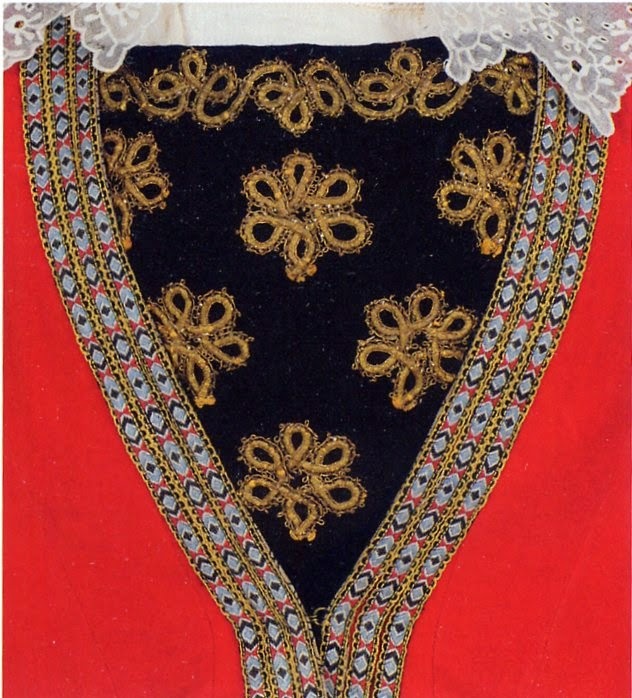 Sometimes the embroidery is in colored silk as here above, but more commonly it is in metallic gold or silver, in many different designs. 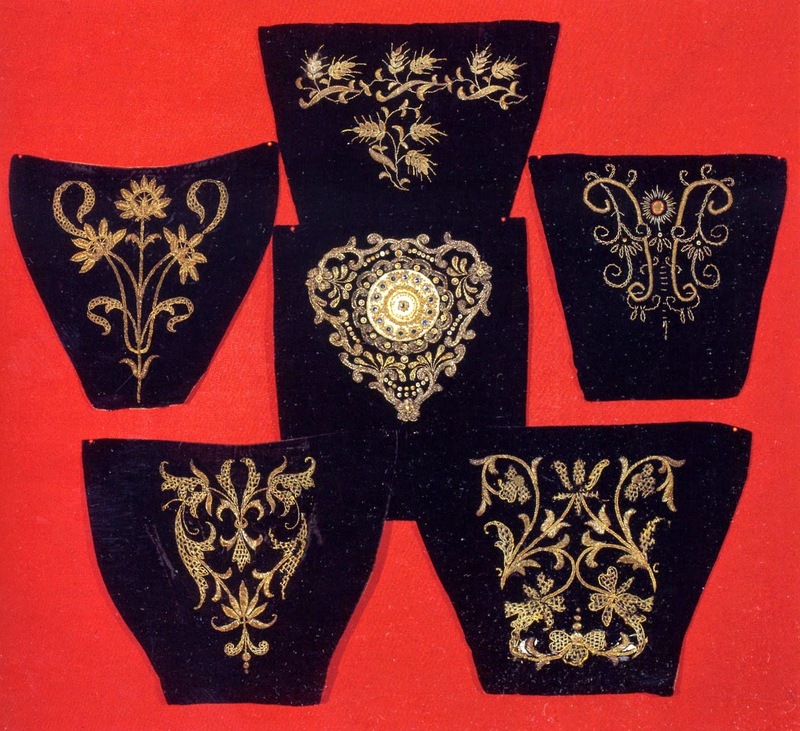 An apron is worn with this, today it is usually of black silk with black lace edging and sometimes inserts. Other colors were seen occasionally in the past, especially for everyday. 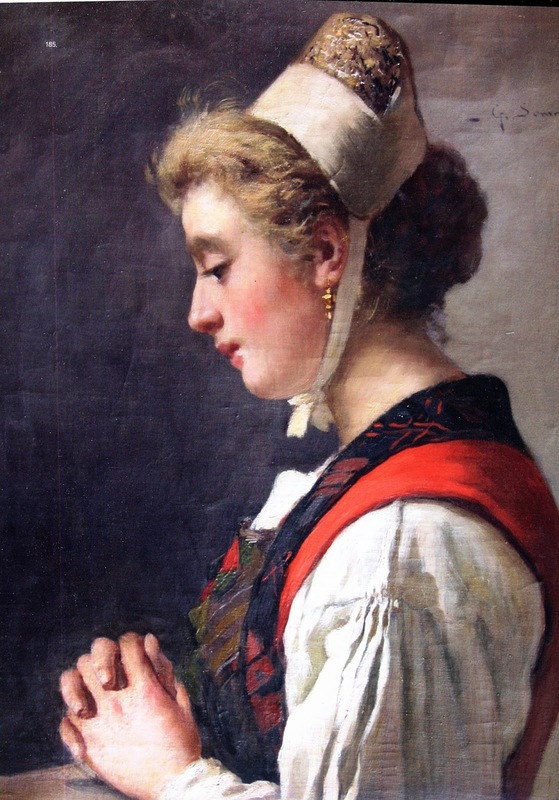 The apron was traditionally worn a little shorter than the skirt, as you can see above in the Calderini print. There is a regrettable tendency today to skimp on the apron, making it short and not gathered, even making the bottom edge rounded. Take a look at the photos in this article. In my opinion this is a degradation of the costume and should be discouraged. 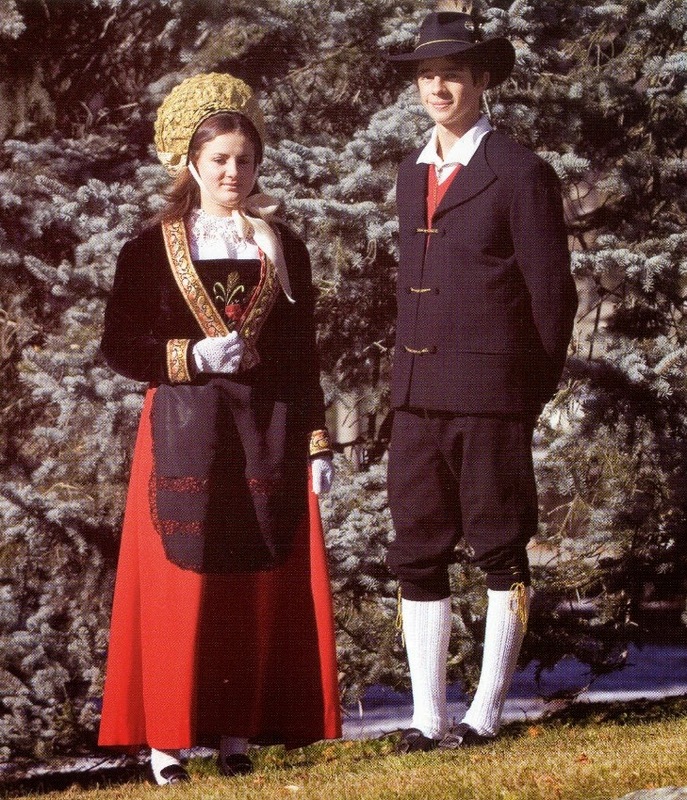 When appropriate, a short black jacket is worn with this costume. 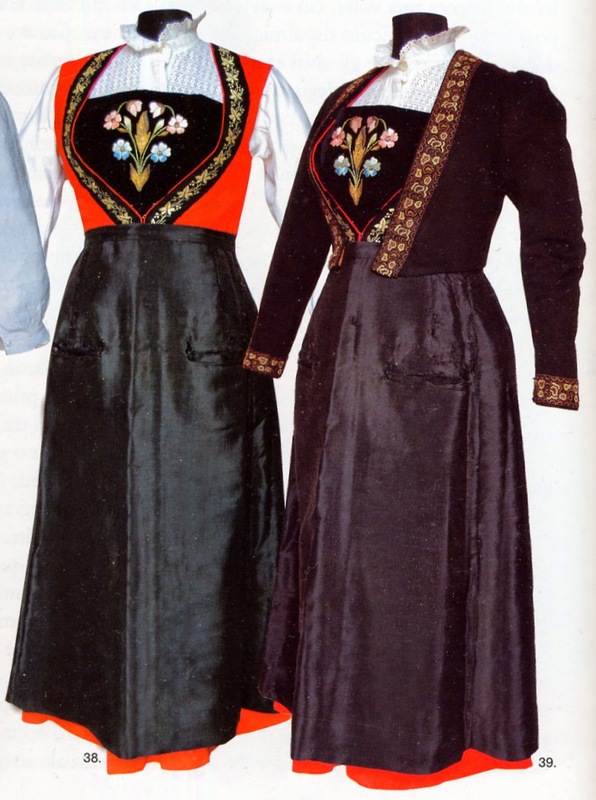 It has narrow black sleeves and is usually open in front, the edge falling to either side of the opening in the bodice. 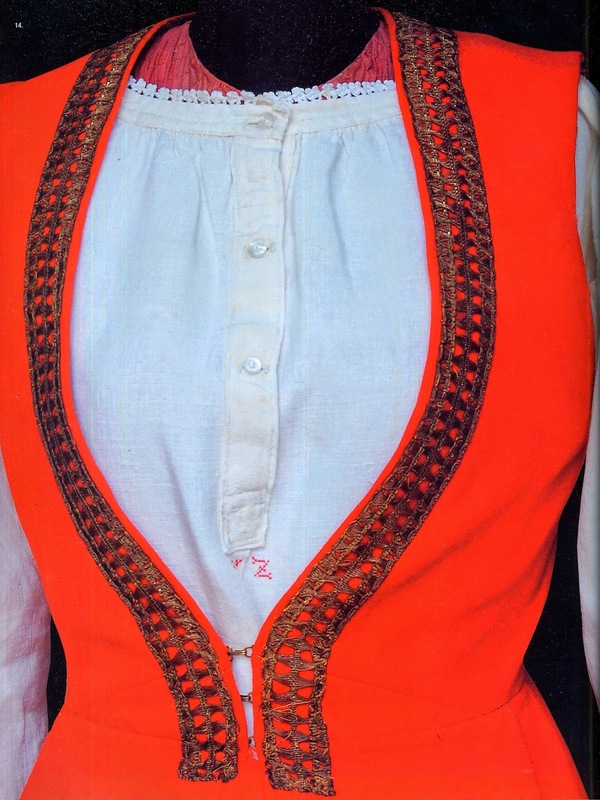 It likewise has galloon or ribbon edging the front and neck opening as well as the cuffs. 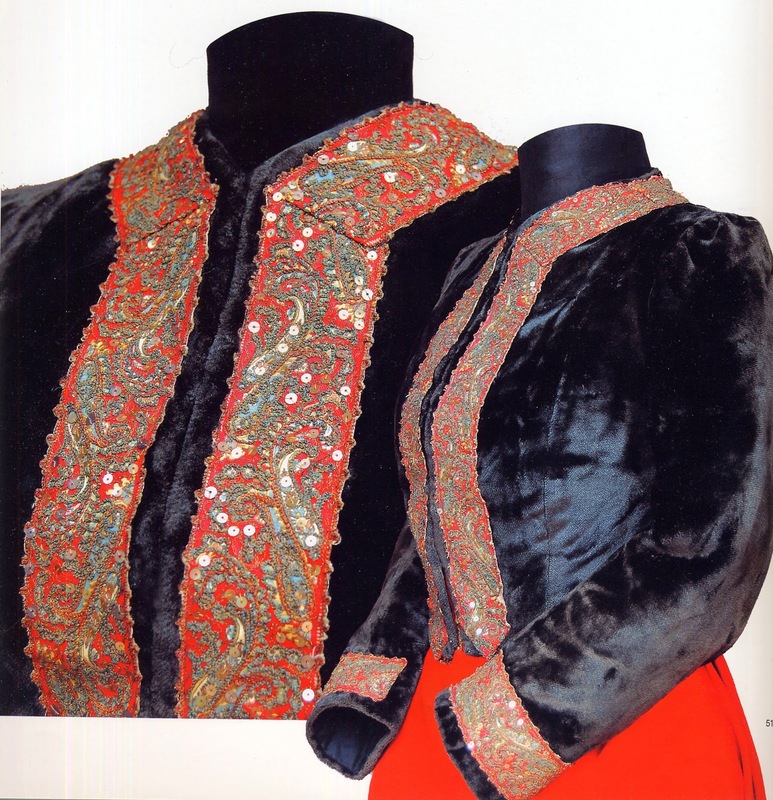 This last image shows a plastron which, unusually, is made of a patchwork of patterned velvet. jackets which close completely down the front, making them warmer, are not unknown. 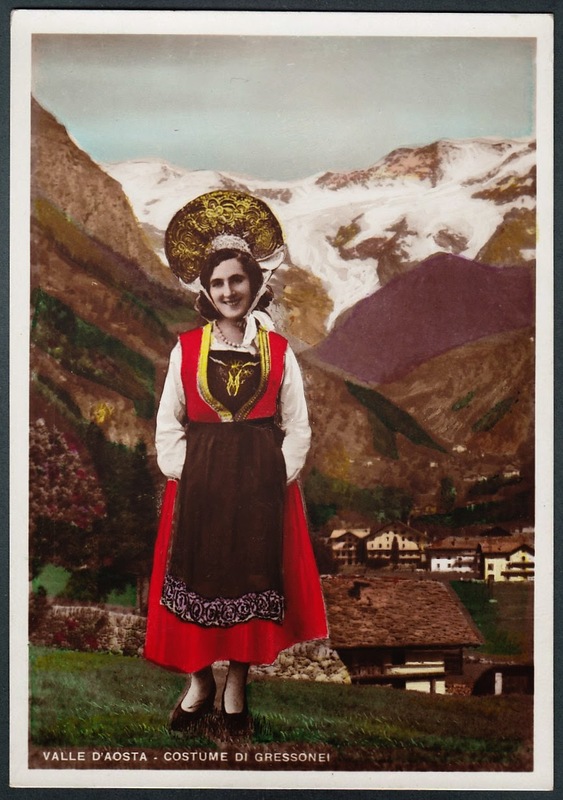 The bonnet shaped caps (haube, cuffie) are the crowning glory of the Gressoney costume. 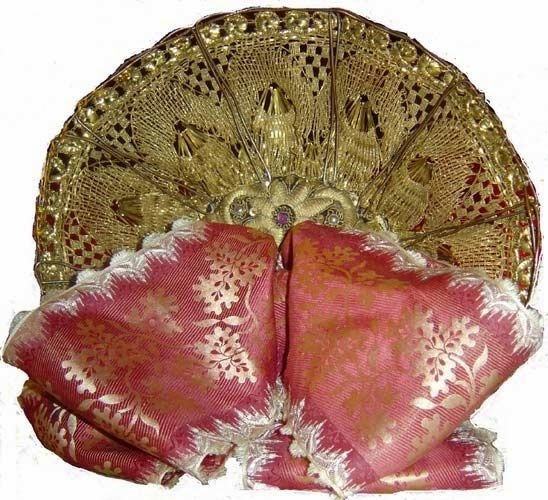 Originally these were rather modest, being made of silk, with decorations of ribbons and perhaps embroidery. 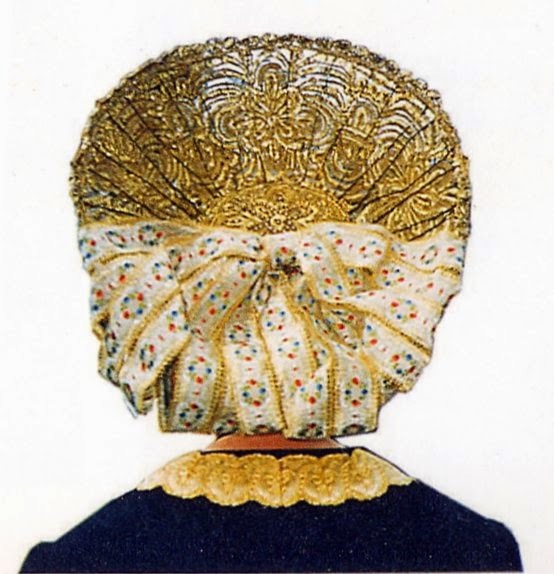 They consist of a round back and a rectangular piece which covered the top of the head. 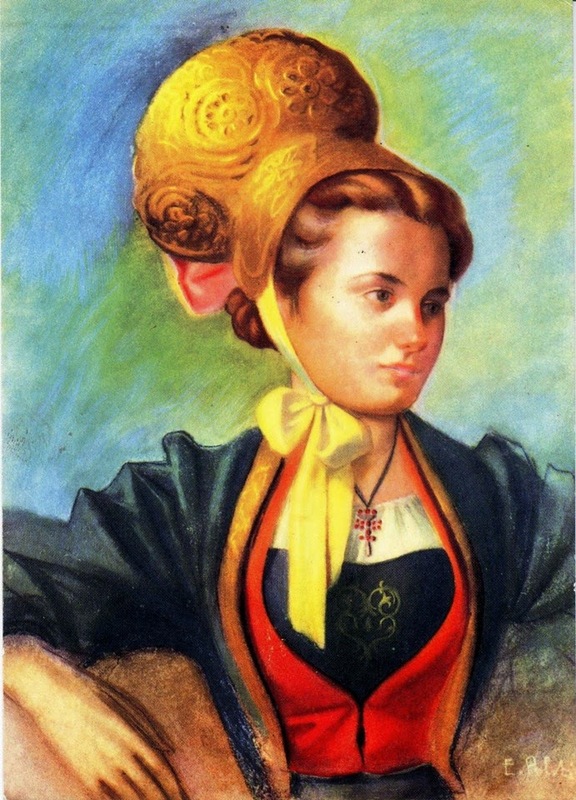 They were always tied under the chin with a fancy ribbon. 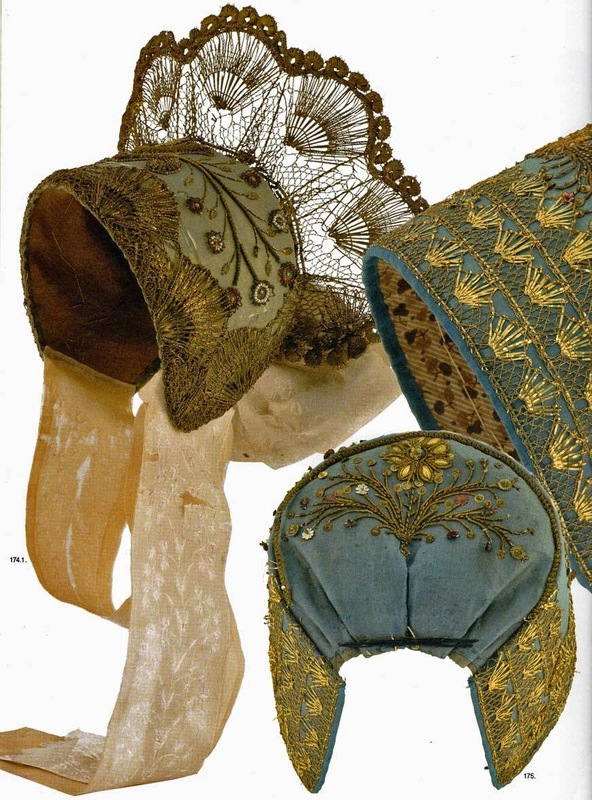 After about 1870 these were for the most part, although not completely, replaced by bonnets which had a gold crest rising from the seam of the two parts of the cap, as you can see on the left of the image above. When necessary, these are supported by wire. 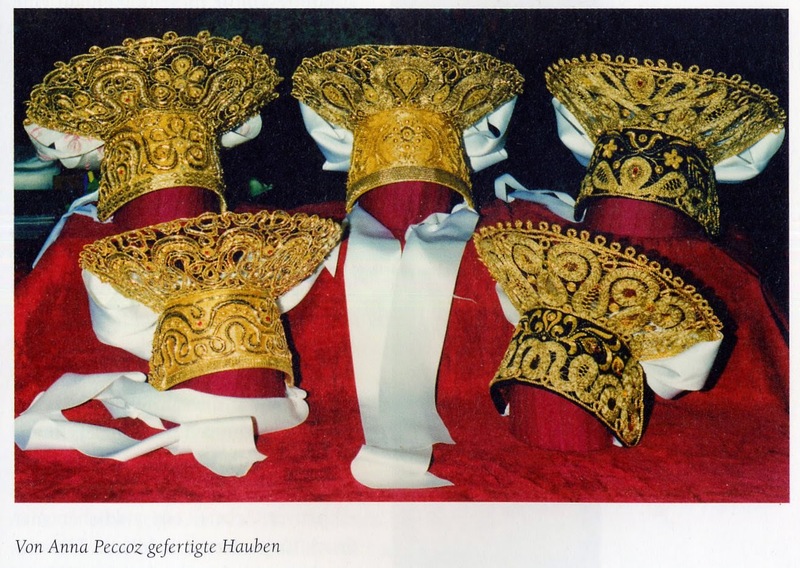 They bear a remarkable resemblance to the radhaube worn in the vicinity of the Bodensee in Germany, Switzerland and Austria. There is no known connection, but the resemblance is striking. The embroidery on them is now mostly metallic gold and silver. 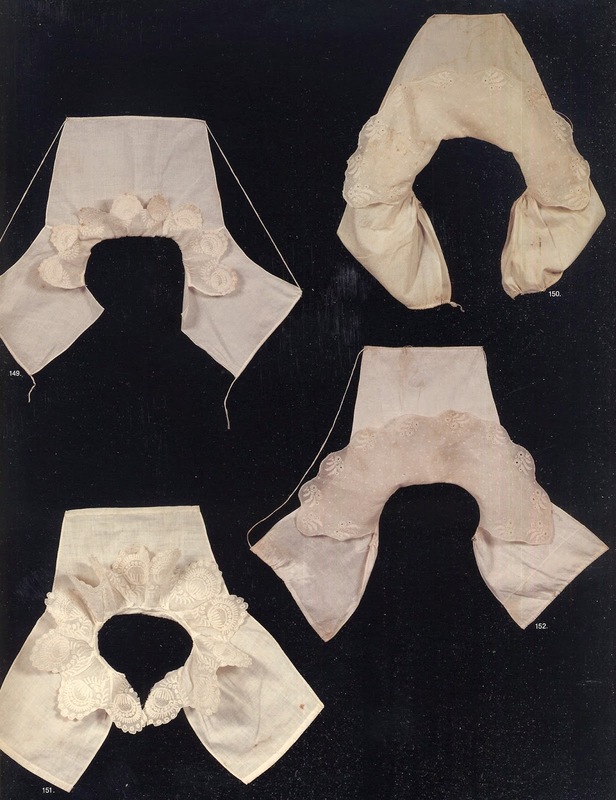 Like the plastrons, there is a remarkable variety in the designs used. 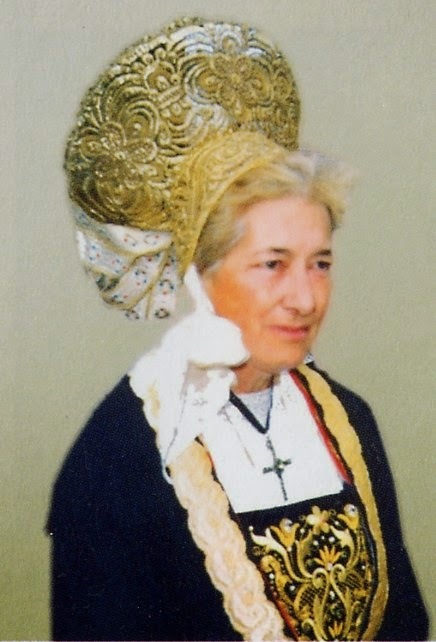 This woman is Anna Peccoz, who makes these headdresses. These in the following image are her work. 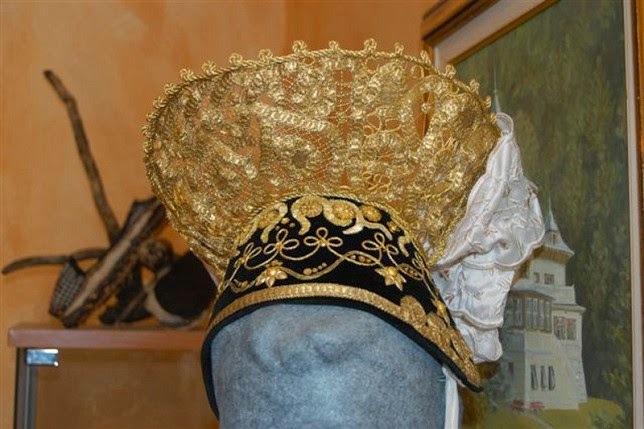 This last one was worn by Queen Margherita of Italy. As you can see, decorative ribbon is tied around the bottom of the headdresses. 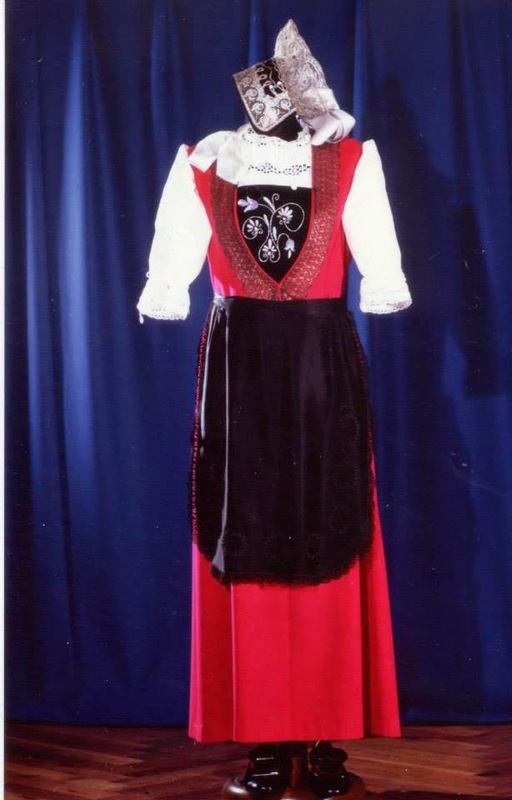 In the past, there were other versions of this costume, including a black version for those in mourning, and some made in patterned materials of various colors. 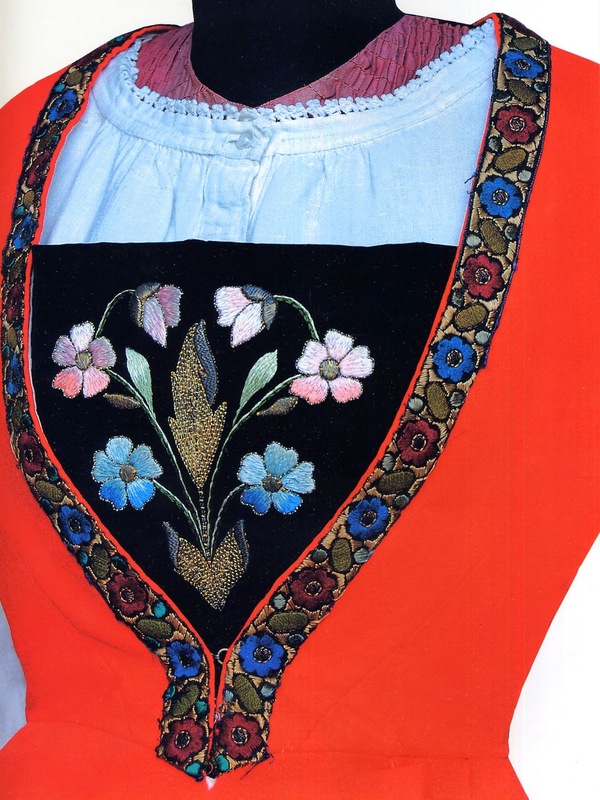 Formerly the front of the bodice had a high neck with no plastron, and was sometimes worn with a shoulder shawl. But this is the version which is almost always seen today. Informative blog. I am looking for name of weavers having a shop near 45th St and Paulina near Holy Cross Church in Chicago in 1960's. 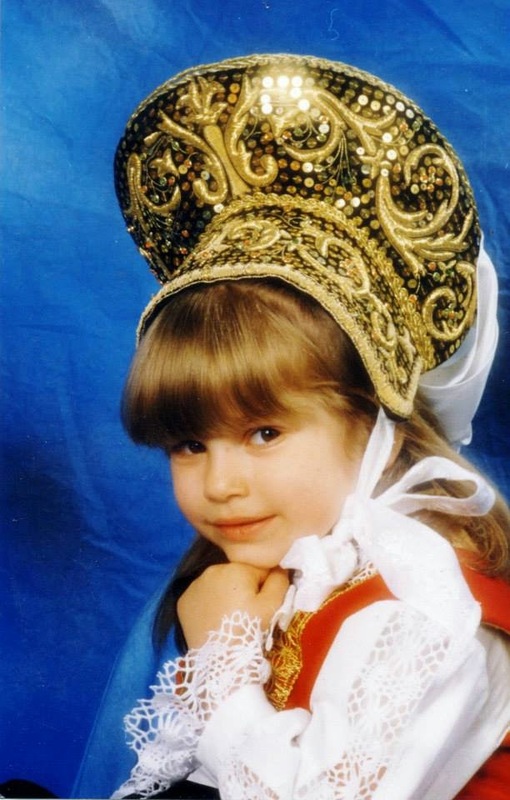 My lithuanian costume was made on order by a husband and wife team who also sewed them and made sashes. I do not know these weavers, but I am sure that you can find out from this Museum. Contact them. Woah, very detailed post! Excellent work as always! 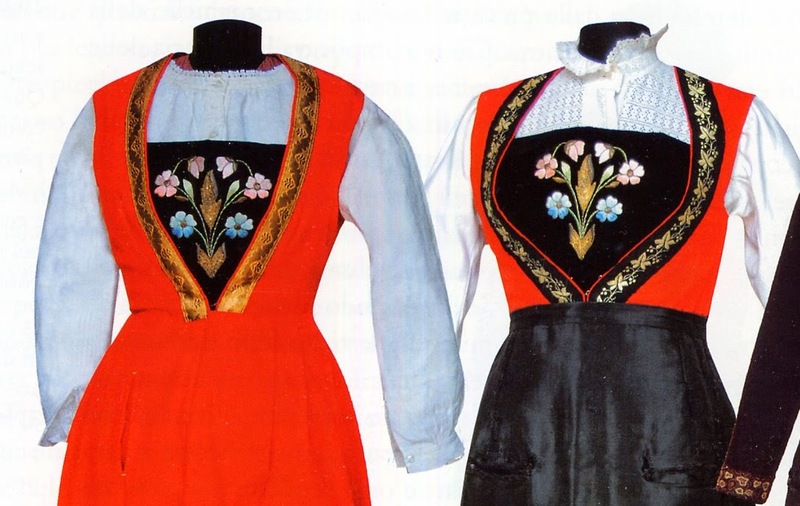 I've stumbled upon your blog after searching Saami folk costume. I'm amazed at the detail you include on your posts and will enjoy reading more of your fantastic posts.